1. 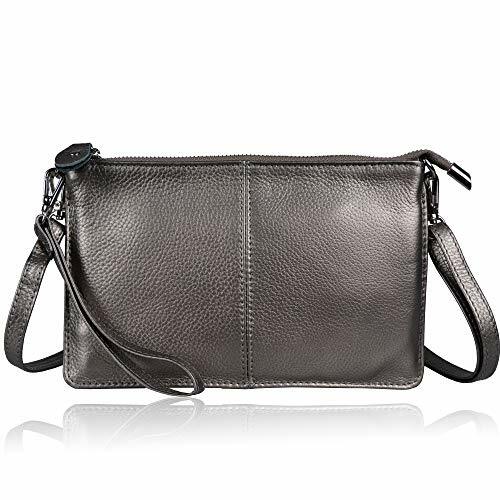 Material: Handmade full grain leather with very soft hand feeling, silver hardware and fabric Lining. Note: please allow slight color difference due to different monitor settings. 2. 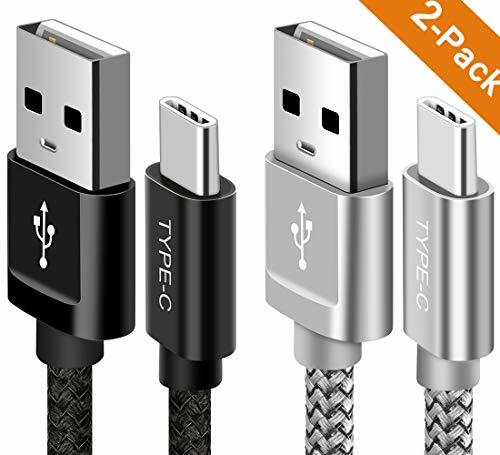 Fits most big screen smartphone, including: Apple iPhone 8 Plus, 8, iPhone X, Samsung Galaxy Note 8, S9 Plus, S9, S8, S8 Plus, Google Pixel 2, 2 XL, LG V30, Huawei P20 Pro, Sony Xperia XZ Premium, OnePlus 5T or any phone smaller than 6.5 inches. 1. 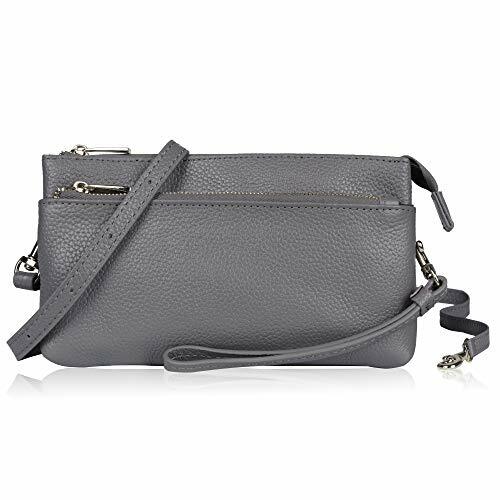 Crafted in rich pebble leather, this versatile bag can be carried as a clutch without the strap, a wristlet or worn crossbody making it the perfect choice for both dressed up and casual looks. Material: Pebble pattern cowhide leather with soft hand feeling, silver hardware and fabric Lining. Note: please allow slight color difference due to different monitor settings. 1. 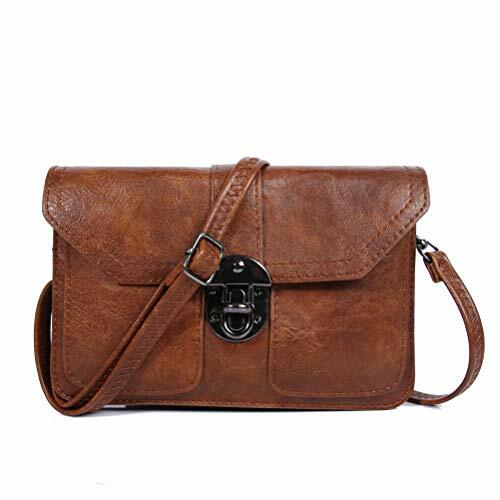 Material: Soft and high quality full grain leather, gold color metal hardware and fabric lining. 2. SMARTPHONES CAN FIT: Fits most big screen smartphone, including: Apple iPhone 8 Plus, 8, iPhone X, Samsung Galaxy Note 8, S9 Plus, S9, S8, S8 Plus, Google Pixel 2, 2 XL, LG V30, Huawei P20 Pro, Sony Xperia XZ Premium, OnePlus 5T or any phone smaller than 6.5 inches. 3. 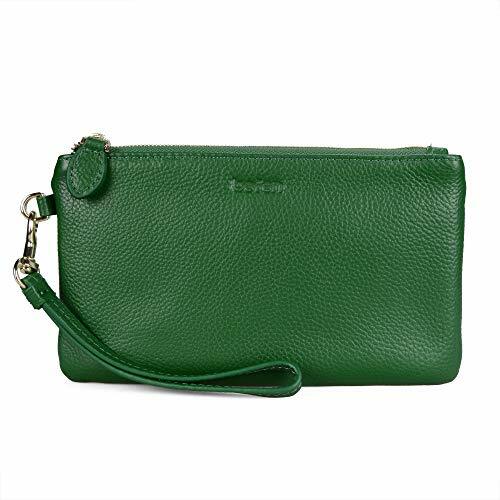 WALLET: Front zipper pocket: 6 credit card slots, a pocket for cash and 1 back zipper pocket. 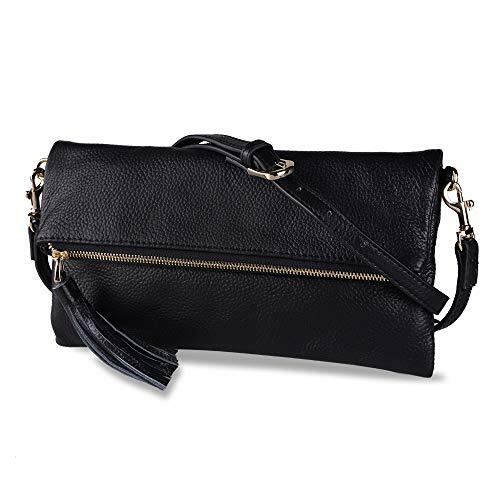 The full length top zipper compartment could hold many necessities including checkbook, passport, lipstick, eye shadow, sun glasses privacy items etc. One zipper pocket on the back. 4. STRAP: One 5.5" removable wrist strap and one removable adjustable shoulder strap up to 55" for different occasions. PRODUCT MEASURE: 9.6"(L)*5.3"(W)*1"(H) inches. 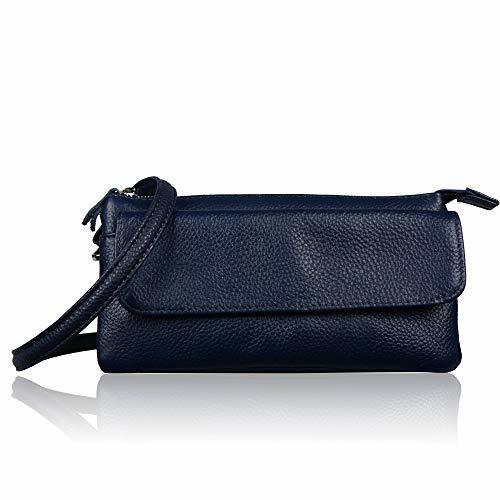 You can use it as a daily clutch, an evening party clutch for dressing up or a cross body messenger bag while dressing down. 5. 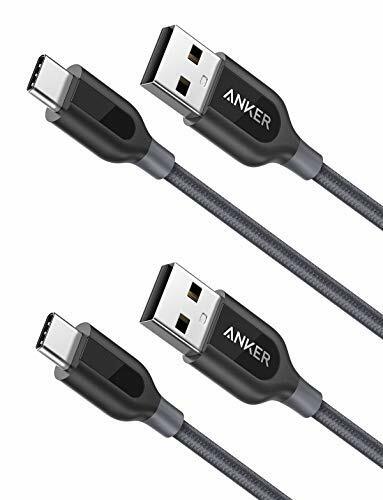 Warranty: We are registered brand at US and UK, anyone bought this product at Amazon Befen Store will have a 1-Year manufacturer's warranty. Please contact us at befen001@befenofficial.com for full manufacturer warranty details. Feel free to contact us when needed, and we'll get back to you within 24 hours. 1. 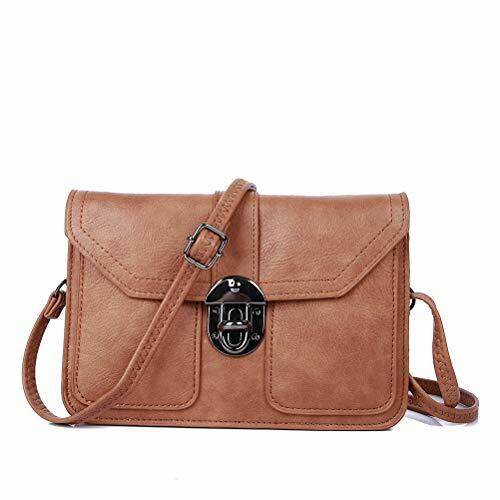 Material: Handmade full grain leather with very soft hand feeling, golden hardware and fabric Lining. Note: please allow slight color difference due to different monitor settings. 1. 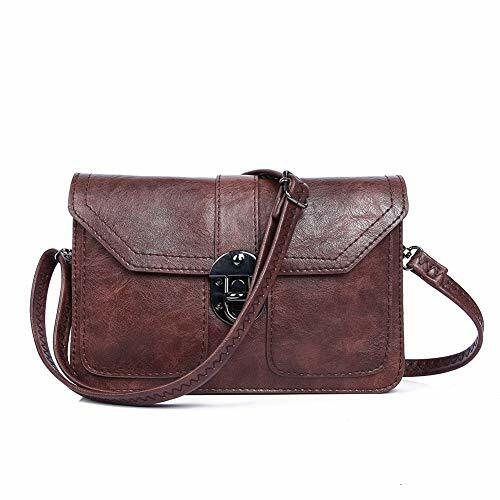 MATERIAL: Soft and supple pebble texture 100% full grain leather, brown interior lining, durable light golden hardware and smooth zippers. 3. 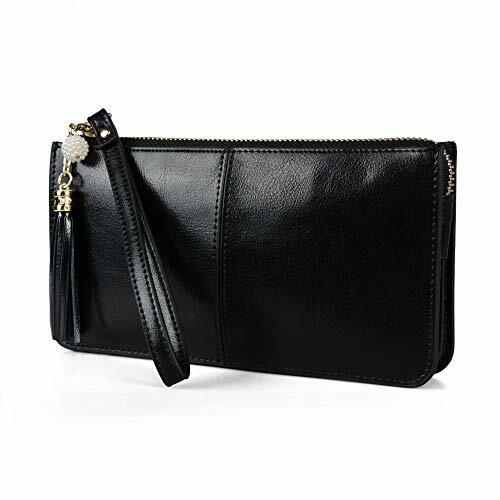 WALLET: Inside: 6 credit card slots, the zippered full length pocket has a roomy space to hold phone, such as iPhone 7/6 plus with a wallet case, makeup, lipstick, eye shadow, perfume and a few keys; an inside zippered pocket for cash. 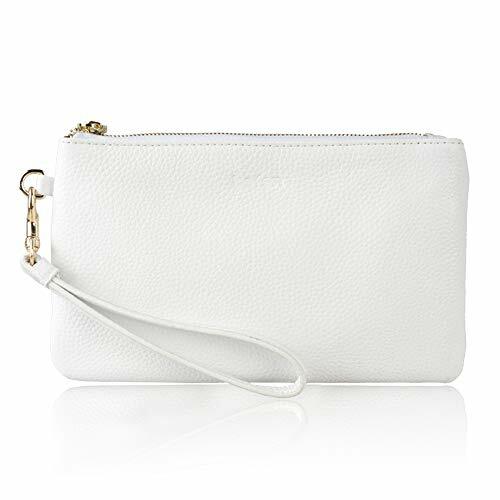 Outside: A back zippered pocket provides quick access for your phone and other small stuff. 4. STRAP: One 6.5" detachable wrist strap. 5. PRODUCT EXTERIOR MEASURE: 8.3"(W) x 5.0"(H) x 0.5"(D) inches. 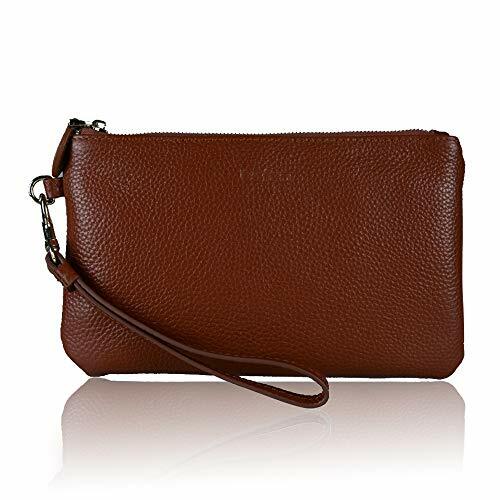 With quality leather and beautiful craftsmanship, it is a perfect clutch for casual night out or attending a party, whether you dress up or down. Soft feel, organized structure, sleek looking make it a perfect gift for your friends or family members. 3. 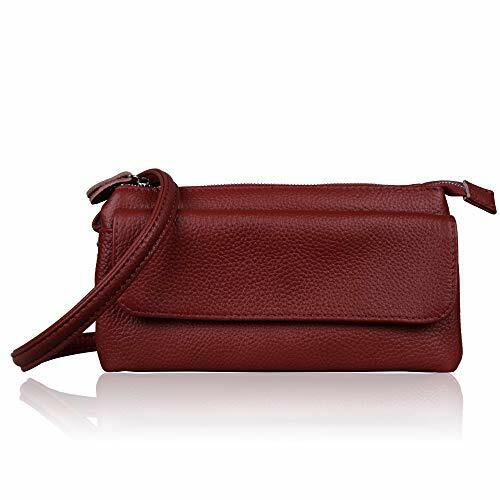 WALLET: Inside: 6 credit card slots, the zippered full length pocket has a roomy space to hold phone, such as iPhone 8/7 plus with a thin case, makeup, lipstick, eye shadow, perfume and a few keys; an inside zippered pocket for cash. Outside: A back zippered pocket provides quick access for your phone and other small stuff. 1. 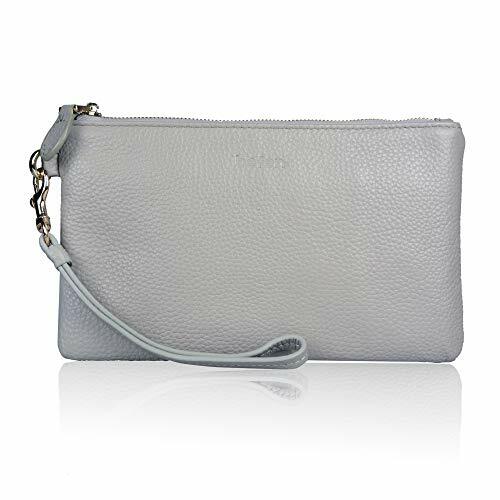 MATERIAL: Pure handmade with pebble cow leather outside with quality silver metal accents. 3. 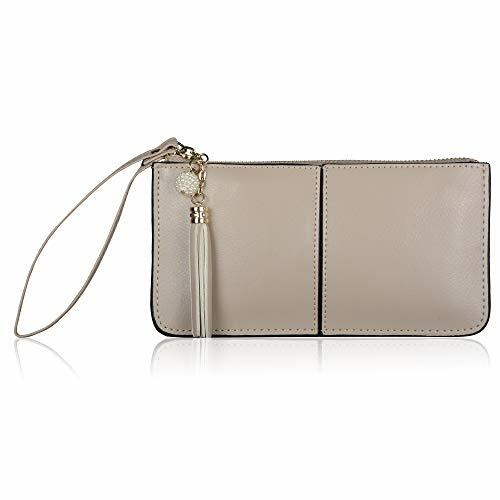 Wallet: Outside: A front pocket with a magnetic snap closure provides quick access to your phone, Inside: 2 side pockets for cash, cheques with 9 credit cards in total, 1 central zipper pocket for your personal belongings. 4. STRAP: 1 removable 6.5" wrist strap; 1 removable cross body strap adjustable up to 53" length to meet various needs. 5. PRODUCT EXTERIOR MEASURE: 7.3"(L)x4"(W)x1.8"(D) inches. And it weighs 0.22kg. The size is perfect for ID, credit cards and phone. 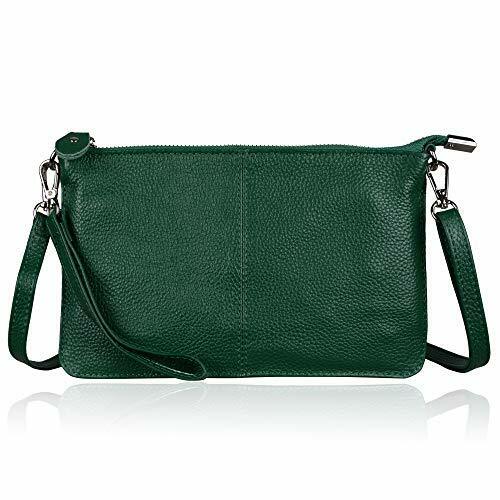 It's light weight, fashionable for night outing, party, travel, shopping and a great gift for your friends. 3. 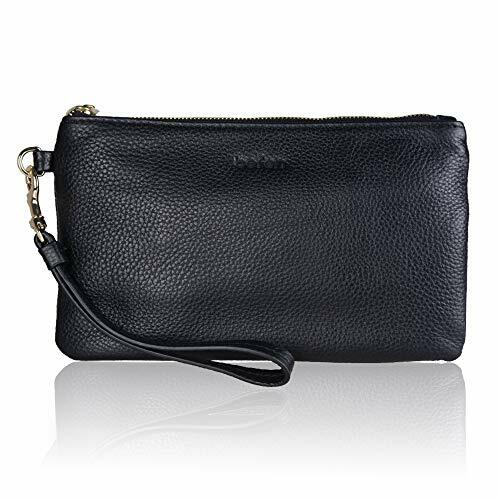 WALLET: Inside: 6 credit card slots; the zippered full length pocket has a roomy space to hold phone, such as iPhone 7/6 plus with a wallet case, makeup, lipstick, eye shadow, perfume and a few keys; an inside zippered pocket for cash. Outside: A back zippered pocket provides quick access for your phone and other small stuff. 3. 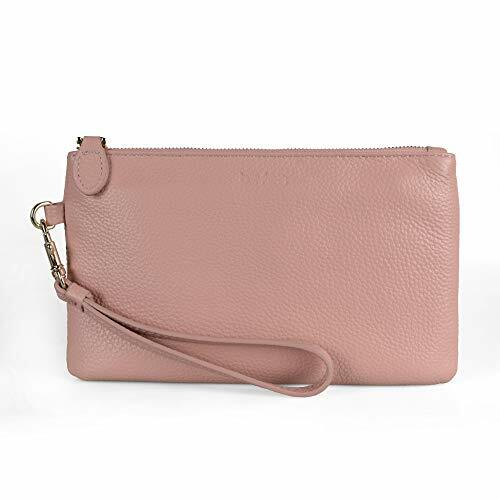 Wallet: Outside: A front pocket with a magnetic snap closure provides quick access to your phone, Inside: 2 side pockets for cash, cheques with 9 credit cards in total, 1 central zipper pocket for your privacy belongings. 3. 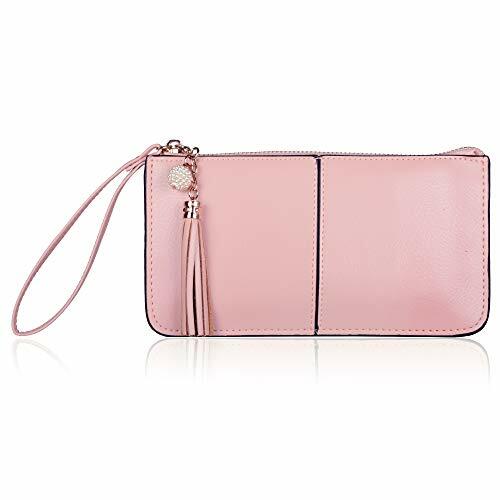 WALLET: Inside: 3 credit card slots for up to 6 cards; the zippered full length pocket has a roomy space to hold phone, such as iPhone 7/6 plus with a wallet case, makeup, lipstick, eye shadow, perfume and a few keys; an inside zippered pocket for cash. Outside: A back zippered pocket provides quick access for your phone and other small stuff. 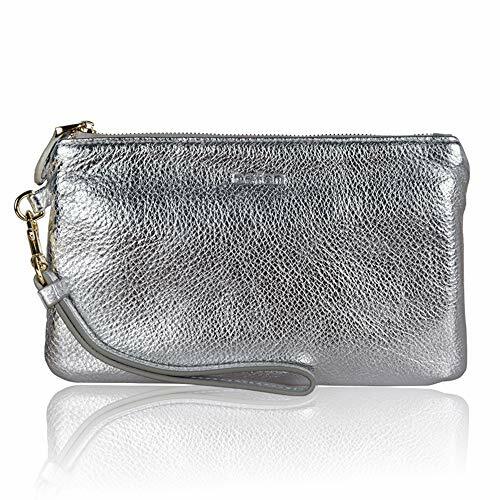 Befen Women Genuine Leather Clutch Wallet Smartphone Wristlet Purse - Silver 1. 1. 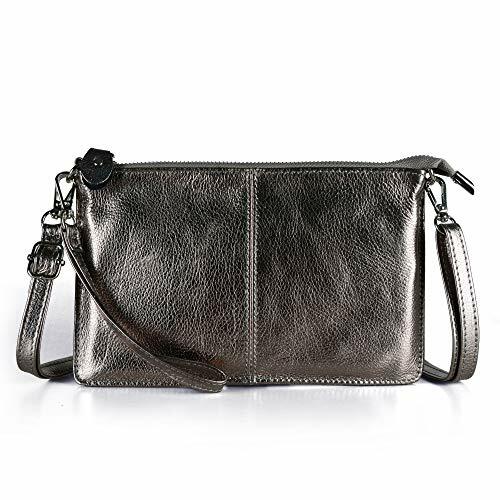 Material: A clutch size purse made with pebble cow leather and soft fabric lining, along with silver-color hardware, heavy duty zipper and fine stitching. 2. 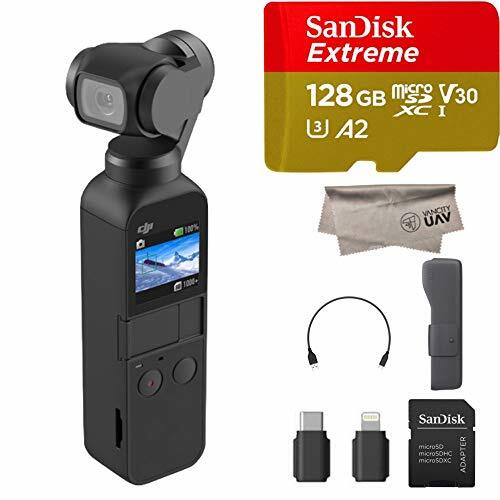 Fits most Smartphone, including: Apple iPhone 8 Plus, 8, iPhone X, Samsung Galaxy Note 8, S9 Plus, S9, S8, S8 Plus, Google Pixel 2, 2 XL, LG V30, Huawei P20 Pro, Sony Xperia XZ Premium, OnePlus 5T or any phone smaller than 6.5 inches. 3. 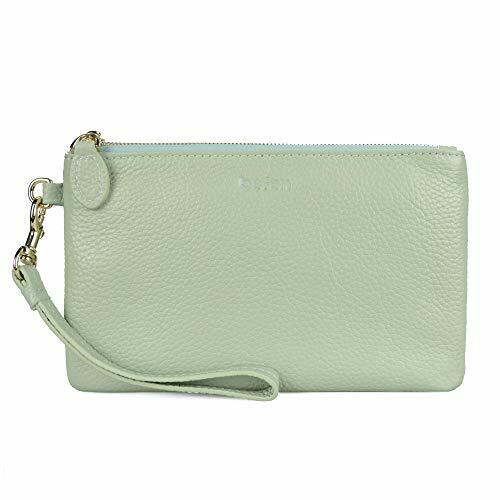 Wallet: 12 card slots and 3 main full-length compartments in total. Has an front magnet pocket for phone and other small belongings. Triple compartments are designed for you to keep your cash, cards, cosmetics, and smartphone well-organized and easy to use. 4. Strap: A removable 6.5" wrist strap and a removable cross body strap that is adjustable up to 50" in length to meet various needs. 5. Product dimensions: 8.3" X 4.5" X 1.8". Looking good either in formal occasion or a night out fun. 1. 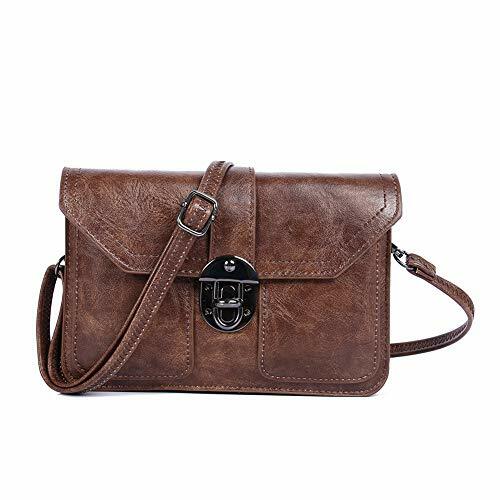 MATERIAL: Soft and supple pebble texture full grain leather, brown interior lining, durable light golden hardware and smooth zippers. 1. 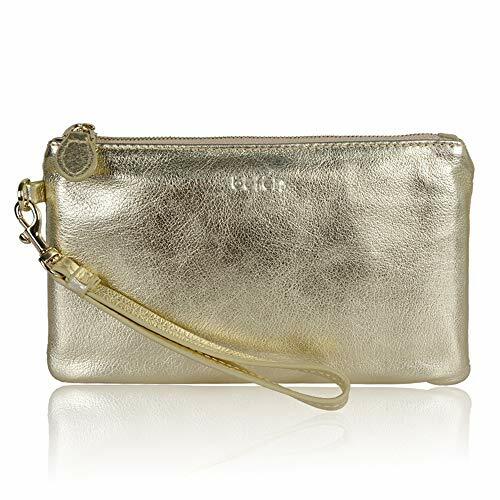 Material: Genuine split leather with gold-colored hardware accents & a leather wristlet to free your hand, Attention: Split leather is leather created from the fibrous part of the hide left once the top-grain, Split leather then has an artificial layer applied to the surface. 3. 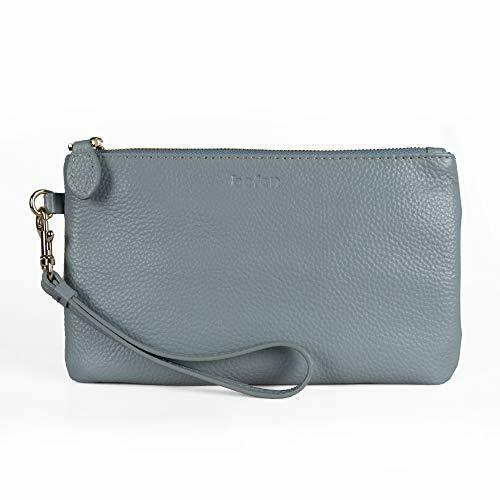 Wallet: 9 credit card slots, 3 generous full-length compartment, one for cash slot, one for phone, and one interior zippered pocket for coins or business cards. 5. Product dimensions: 8.1"(W) x 4.3"(H) x 0.8"(D), weight is 0.48 pounds. Pls note: if you use the phone with a case, it should be a slim case. 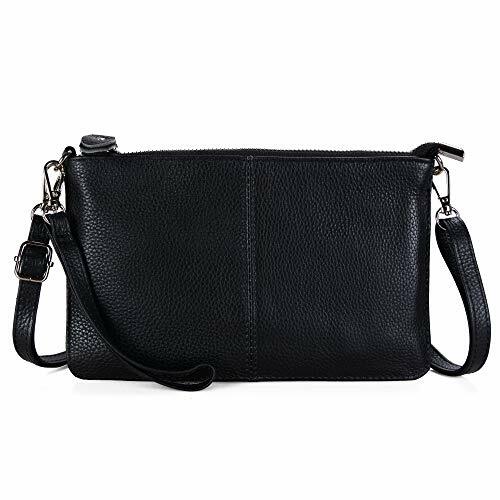 Befen Women Genuine Leather Clutch Wallet, Smartphone Wristlet Purse - Black 1. Dimensions:8.2 inch(L) * 1inch(W) *5.7inch(H).Comes with detachable 55" shoulder drops. 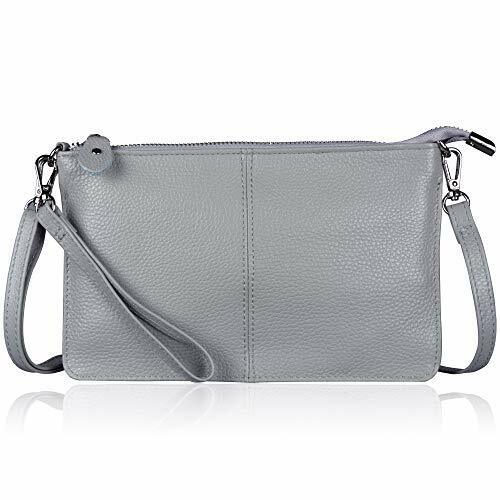 Small purse has 3 pockets one has a zipper, 2 small pockets on front, You can carry all your cards, passport, IDs, receipts, cell phone, tickets and other small items securely. 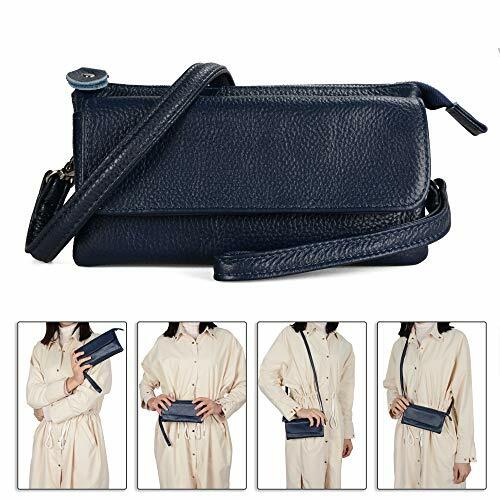 Crossbody Bag perfect for holding the phones up to 7 inch, such as：iPhone XS, XS MAX, 8 Plus, 8, iPhone X, Samsung Galaxy Note 8, S9 Plus, S9, S8, S8 Plus, Google Pixel 2, 2 XL, LG V30, Huawei P20 Pro, Sony Xperia XZ Premium ect. 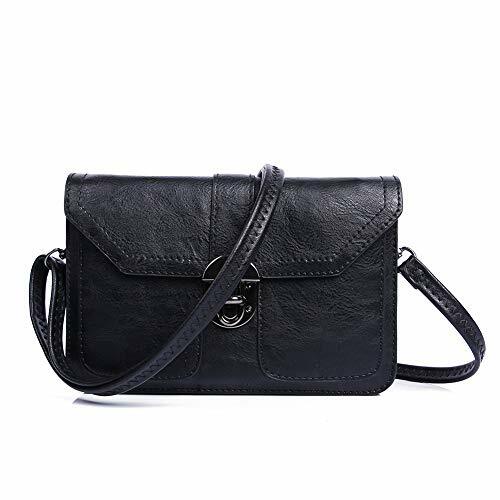 This small comfortable crossbody purse makes the perfect gift for any occasion like christmas, valentines, birthdays and anniversaries. This is truly the one gift that will be enjoyed when going out shopping, work, travel or vacations. 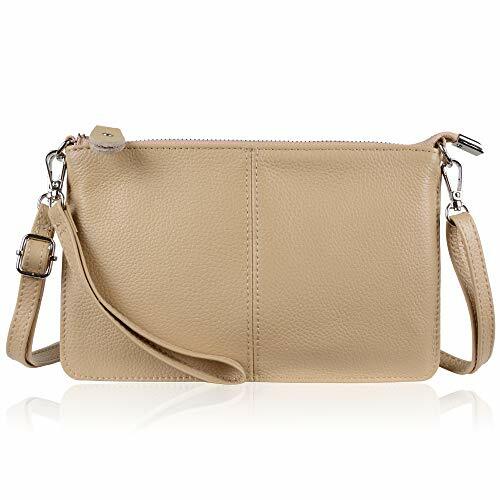 Dimensions:8.2 inch(L) * 1inch(W) *5.7inch(H).Comes with detachable long shoulder Strap(32in-55in). High quality Oil faux leather & Gun metal hardware;The cross lock is more durable and not easy to scratch. 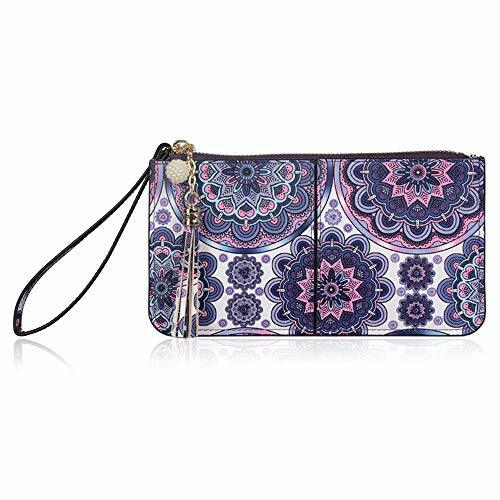 This small purse has 2 Compartment and 1 zipper Compartment inside is fitting for wallet, ,cell phone, sunglasses,passport,lip gloss or other things . 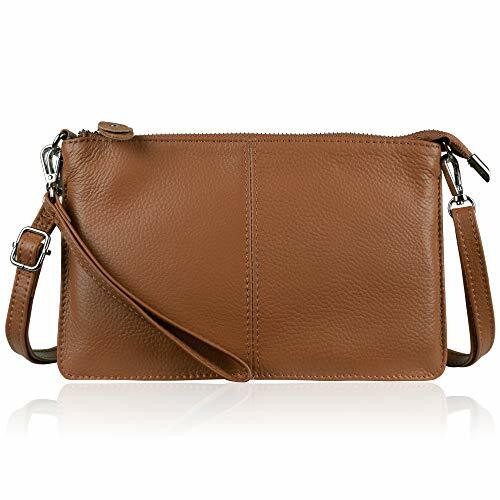 2 card pockets in front is fitting for small items such as credit cards and keys. Ultra Soft faux leather & Gun metal color hardware;The cross lock is more durable and not easy to scratch. Soft synthetic leather with snap closure design, safe and easy to use. Smooth bronze color zipper and detailed streamlined stiching. 20 card slots, including 4 clear plastic ID/photo slots. 4 bill sections, 2 full length clear plastic slots and 1 zipper pocket. 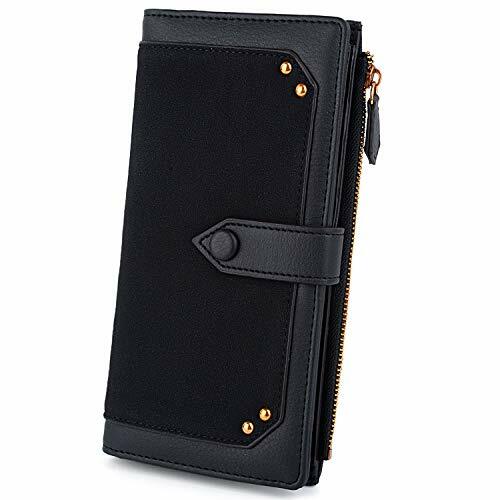 Comfortably holds your credit cards / ID card / bills / checkbook / 5.5" smartphone and under, like iPhone 7 plus/6 plus/7/6s/6/5s/se, HTC 10, LG G5/G2/K3, Sony Xperia XZ/Z5. Perfect gift for teen girls/mother/wife/girl friend. Dimensions: 7.67"L x 0.98"W x 3.93"H.
1. MATERIAL: Soft PU leather in leopard pattern with gold-colored hardware accents& an exquisite tassel. 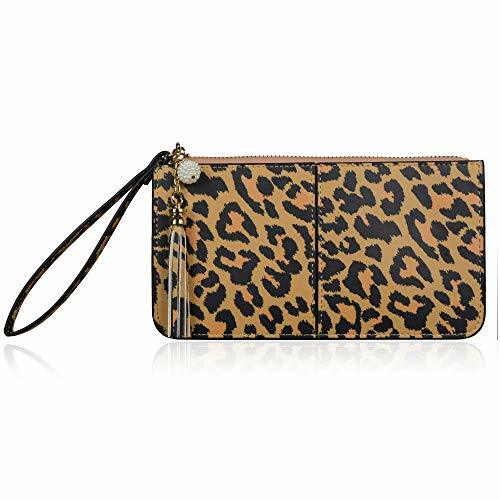 Attention: the leopard pattern can't be exactly same on each wristlet, small difference should be acceptable. Inside: Fabric Lining. 2. Fits any phone up to 6.0" X 3.1" X 0.3" inches, including: Apple iPhone 6Plus, 6, 5S 5C 5 4S 4, Samsung Galaxy S5 S4 S3, Google Nexus 5, LG G2, HTC One M7, Sony Xperia Z, Moto X, Moto G, Droid Razr. Please Note: Phones longer than 5.7" can't be fit into the middle pocket but fit into both side pocket. 3. 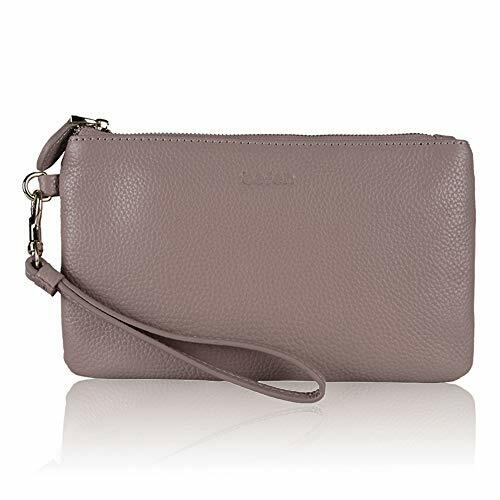 WALLET: 3 main full length compartments, one for cash slot, one for phone, and one zippered compartment for small and valued items; 9 ID card slots, 1 invisible zippered pocket. 4. STRAP: 1 removable 6.5" wrist strap to free your hand. 5. 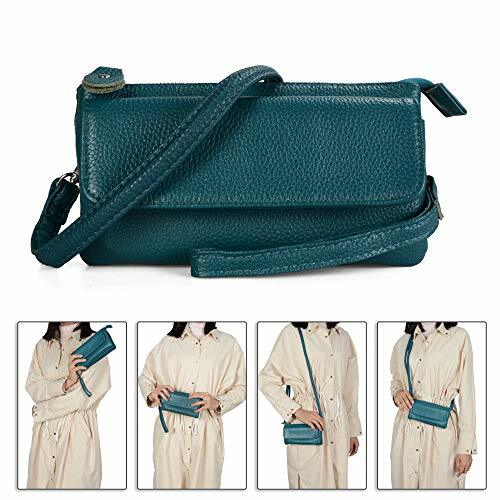 PRODUCT EXTERIOR MEASURE: 8.1"(W) x 4.3"(H) x 0.8"(D) inches, the photos are taken by the actual wristlet; please forgive the slight color difference caused by light and monitor. Creative Huawei P20/P20 Lite/P20 Pro Wallet Case: 100% fit for your Huawei P20/P20 Lite/P20 Pro. Card slots Backside: The design of card slots inside of your Huawei P20/P20 Lite/P20 Pro case is convient for your to store your ID, Credit Card Cash holder or anything important.For the best performance, please only insert 1 card for each card slot. Precision cutouts :Precision cutouts allow full function of all ports, buttons, cameras, speakers, and mics,slide action is not affected.Full access to all ports. Ultra-strong magnetic closure of your Huawei P20/P20 Lite/P20 Pro provides security & peace of mind. 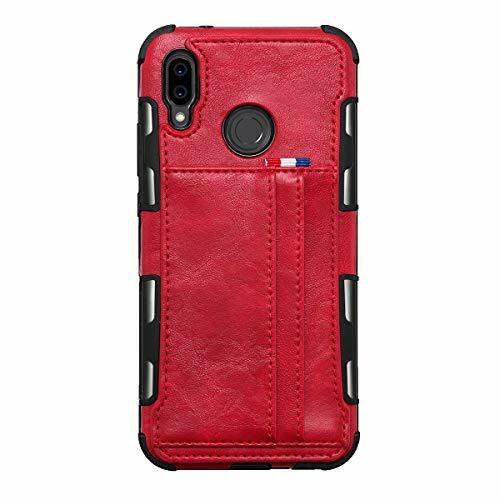 360 Full Protective:360 degree flip wallet case can make a full protection of your Huawei P20/P20 Lite/P20 Pro .Resistant to all drops,scratches or any damage. 100% Product Guarantee: Your satisfaction matters!Zater is committed to give customer an excellent shopping experience ,if you have any questions about our Huawei P20/P20 Lite/P20 Pro case , please do not hesitate to contact us., We will reply you in 24 hours. If this wallet case doesn't make a winning impression, let us know. We'll promptly reimburse you for every cent of the purchase price. 1. 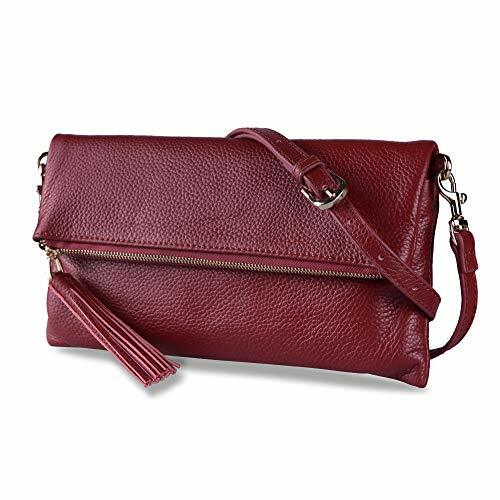 MATERIAL: Soft PU leather with gold-colored hardware accents& an exquisite tassel. 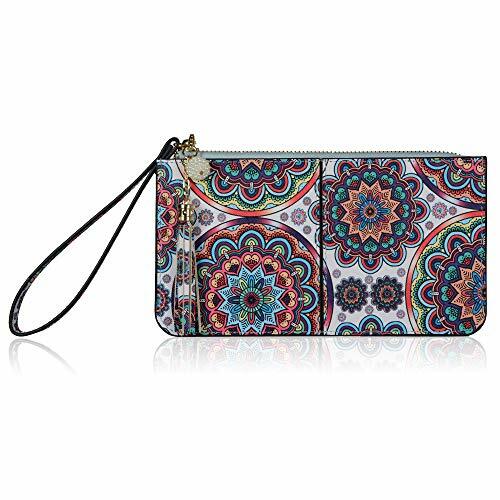 Please note that the printed pattern can't be exactly the same on each wristlet, please allow small difference. Inside: Fabric Lining. 2. Fits any phone up to 6.0" X 3.1" X 0.3" inches, including: Apple iPhone 8 Plus, 7, Samsung Galaxy S5 S4 S3, Google Nexus 5, LG G2, HTC One M7, Sony Xperia Z, Moto X, Moto G, Droid Razr. Please Note: Phones longer than 5.7" can't be fit into the middle pocket but fit into both side pocket. 2. SMARTPHONES CAN FIT: Fits any phone up to 6.1" X 3" X 0.3" inches, including Apple iPhone 6 Plus, 6, 5S 5C 5 4S 4, Samsung Galaxy S7, S6,S6 Edge, S5, S4, S3, Note 5, Note 4, Note 3, LG G4,G3,G2, HTC ONE M9 and HTC 626S. PLEASE NOTE: If you put your iPhone 6 plus with a bulky wallet case, it will be a little tight. Phones longer than 5.5" can't be fit into the middle pocket but fit into both side pocket. 5. Warranty - Befen is a register Brand at USA and Amazon. We support our buyers, If for any reason you're not 100% SATISFIED, you can contact our service freely through Amazon, our professional customer service team will make things right: full refund or a free replacement, whichever you prefer. Please note that the photos are taken by the actual wristlet; please forgive the slight color difference caused by light and monitor. 1. MATERIAL: Soft PU leather in vintage newspaper pattern with gold-colored hardware accents& an exquisite tassel. 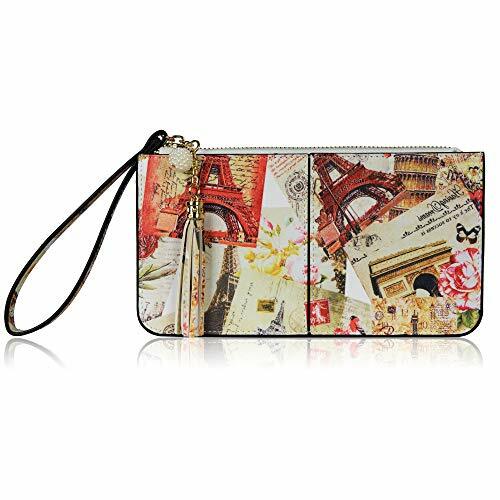 Attention: the newspaper pattern can't be exactly same on each wristlet, small difference should be acceptable. Inside: Fabric Lining. 1. 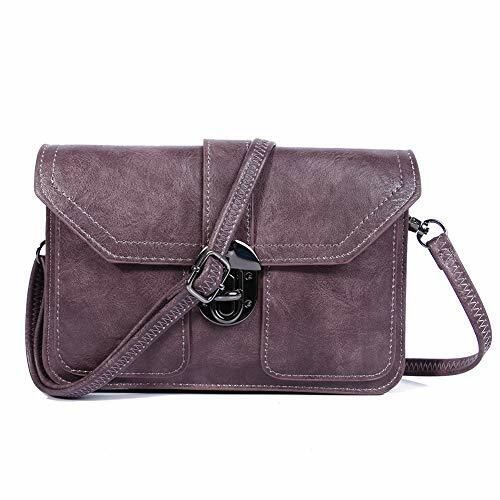 Material: Soft and high quality full grain leather, gold color metal hardware and fabric lining, with adjustable shoulder and wrist straps. 2. 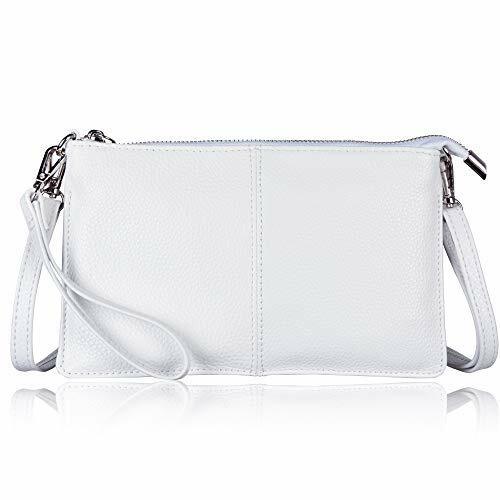 WALLET: Small triple zip crossbody bag and wristlet purse inclued 6 credit card slots, 1 front zipper pocket. The full length top zipper compartment could hold many necessities. 3. STRAP: Product exterior measure: 8.2"(L)*4.5"(W)*2"(H) inches. 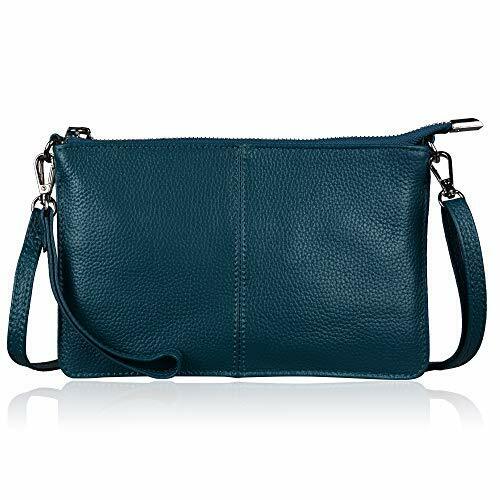 Has one 5.5¡± removable wrist strap and one removable adjustable shoulder strap up to 55¡±. 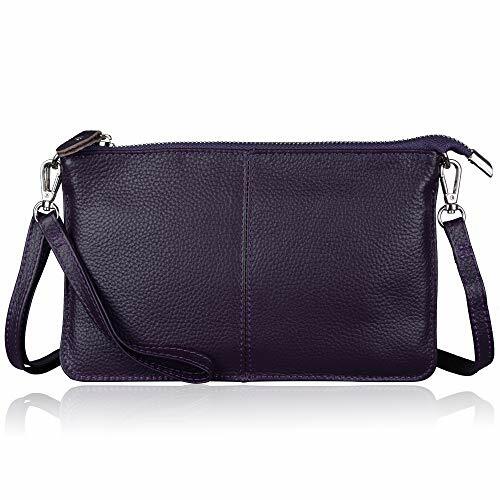 You can use it as crossbody bag and wristlet purse when going to shopping. 4. SMARTPHONES CAN FIT: Fits most smartphone such as iPhone X/ 8/ 7Plus, Samsung Galaxy S7 Edge, S7,S6 Edge, Google Nexus 5 and so on. 5. Warranty: Anyone bought this product at Amazon Befen Store will have a 1-Year manufacturer's warranty. Feel free to contact us when needed, and we¡¯ll get back to you within 24 hours.